You are here: Home / General Real Estate / Who’s Accountable at Zillow? This house is listed for $249,900. It’s a great house near UVA and Fry Springs. But it’s certainly not listed for $75k. When I make a mistake (it happens), I’m accountable. My clients (or the public) can call me. 434-242-7140. When Zillow makes a mistake, who do you call? 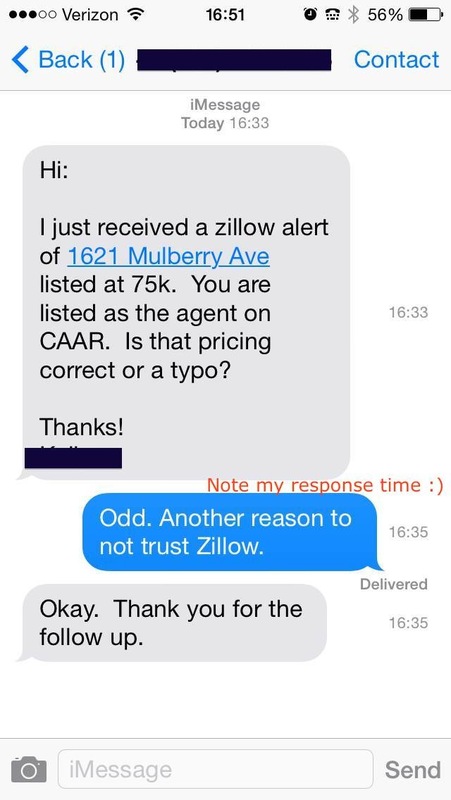 I responded to the above text in 2 minutes; it’s been 18 hours and I’ve not yet heard from Zillow. Would you trust the largest real estate advertising site in the country? For those curious (and this is accurate today and for at least the next 6 months) – the best places to search for homes for sale are my site and Nest’s site. Accuracy matters, right? This is the thing that the real estate community seems to be sweeping under the rug. The free advertising supplied by Trulia and Zillow comes at a price. In accurate data, misleading property values, rental listings that are not active – at what point does free advertising hurt the agent and their clients? It is about time that the real estate community forces these two sites to meet higher standards.